Peer regions were chosen for their comparable size and composition. These same regions have been used for comparison in multiple other studies and reports. Source: JobsEQ, Chmura Economic and Analytics, 3rd quarter 2017. U.S Bureau of Labor Statistics, U.S Census Bureau. High skilled workers are defined as those with a bachelor's degree or higher. A positive number shows the percentage of the labor force that has high skills but is employed in occupations requiring less skill. A negative number shows the region has a deficit of workers with high skills to fill the occupations present. The term “underemployment” is defined as an employment situation that is insufficient in some important way for the worker (i.e. holding a part-time job despite desiring full-time work; over-qualification where an employee has education, experience, or skills beyond the job requirements). The ideal for the economy is to have an equilibrium of workforce with the right skills for the jobs provided. In the Richmond Region, underemployment has increased from 1.3% to 3.2% since 1st quarter 2015. 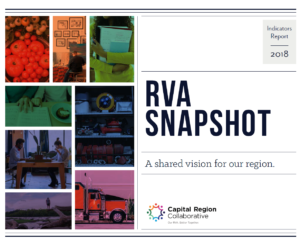 2018 RVA Snapshot: A Shared Vision for Our Region (PDF) is the annual report highlighting baseline indicators in each priority area that will help us capture the current state of our region, compare ourselves to similar communities, and measure progress over time.